Google's Digital Wellbeing app is now out of beta. With the app, users can monitor daily how often they use their Android phones and the apps that are installed on it. 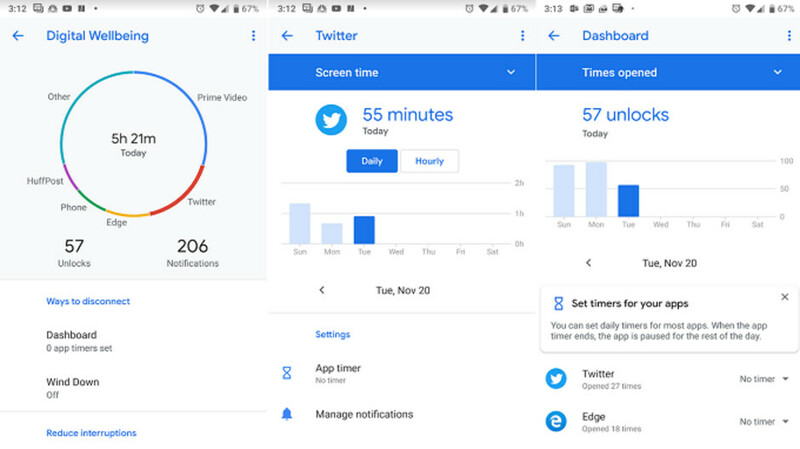 Users can also cap the amount of time they spend on certain apps, track the number of notifications received daily, and more. Version 1.0 of the app can be installed from the Google Play Store on Pixel and Android One devices running Android Pie 9. The update that took Digital Wellbeing out of beta also includes improvements to the app's "back button behavior." It also allows the Wind Down feature to turn off at the time selected by the user, or when the next alarm goes off, whichever is first. The Wind Down mode is designed to get the phone's user ready for bedtime by enabling the Do Not Disturb setting, and turning the screen from color to Grayscale. The combination limits the number of notifications distracting the user, and makes the screen less stimulating. Similar to the Screen Time feature that Apple introduced with iOS 12, Digital Wellbeing is supposed to prevent children and adults from becoming addicted to their smartphones. Earlier this year, we told you about a test of the Screen Time dashboard conducted by a New York Times reporter. The latter was able to get a teenage iPhone user to cut in half the amount of time she spent each day on her phone over a period of three weeks. Thanks for Sharing this wonderful article now I can manage my time efficiently while I am using my phone.